Must Have Tools for Painting Furniture + a Giveaway! 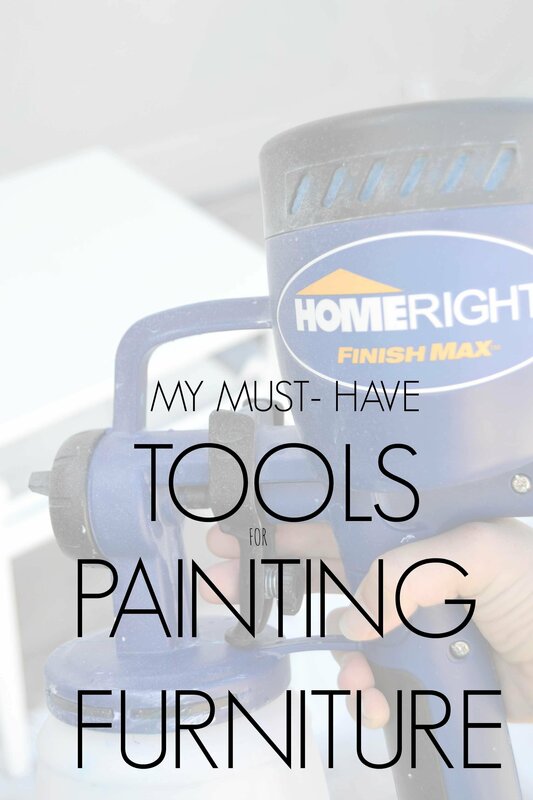 Must Have Tools for Painting Furniture + a Giveaway! Must Have Tools for Painting Furniture + a Giveaway! A few things used to hold me back from bigger projects. Space, time, and uncertainty if the end result would be worth the back ache I was bound to have when it was done. 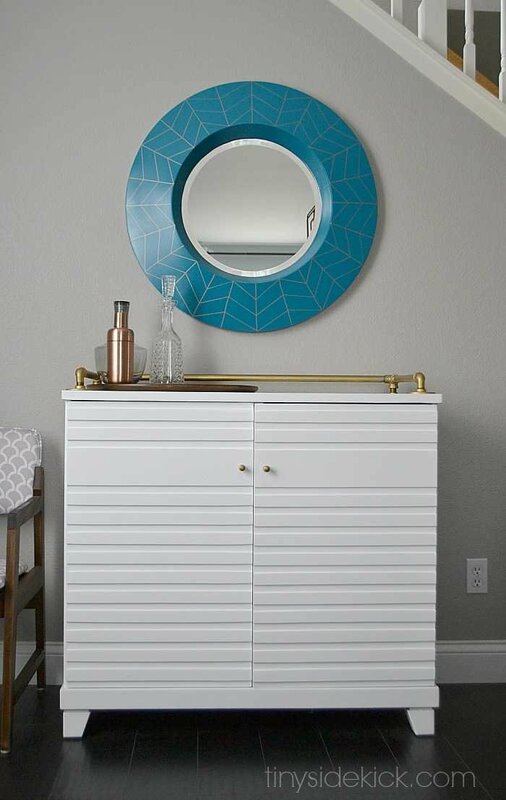 But I’ve learned a few tricks and have much better tools for getting the job done and the results have been beautifully redone pieces for my home at a fraction of the cost I would have paid buying new. So today I partnered with Home Right to give one of you lucky ducks the chance to try this tool bundle that will have you painting like a pro! The Home Right Finish Max was the first of these tools that I ever owned and I love it! I’ve taken on big jobs with this sprayer! This cabinet that I turned into a bar for our dining room is my favorite, but I also updated out interior doors with a fresh coat of white paint (and a perfect finish) with it! I recently tried out the spray shelter too. I had no idea that the thing would be big enough to spray really large pieces of furniture, so I started out with this small piece. I guess now that I know I have a space to paint it, I’ll be on the hunt for a big ol’ piece of furniture! And of course the good people at Home Right must know that the worst part of any DIY project is the clean up. So they created a cleaning kit that attaches right to your faucet so you can easily clean your sprayer. (Enter the voice of the DJ guy on The Price-is-Right) And all of this can be yours! All you need to do is enter the giveaway below! Did you hear him in your head? Now get to entering and good luck! This would be perfect for all of the painting I’m about to do in my kitchen/dining room remodel! I could think of tons of things I’d be painting. Love reading your blog! I am presently following your Room Refresh in the master bedroom. I would really put a home right sprayer to use painting my 1960’s bedroom suite. (: It is long overdue! ha ha. I have so many projects I could do with this giveaway! Thanks for the opportunity to enter. As a new homeowner, I have about a billion and one painting projects in mind. Definitely putting this on my Christmas wish list. I would love to paint my headboard and a dresser. I plan on painting a free find! A small dresser the neighbor threw away!! I would so love to win this! There are so many pieces that I would love to do but can’t because pairing takes a toll on the body! But good luck to the winner! I am remodeling my pre-teen daughter’s bedroom so this would come in really handy. I would use it to paint the dressing table that was in my bedroom as girl that I am passing down to her. I would also paint my kitchen cabinets. Ha! I sure hope you win! Sounds like you would get a ton of use out of it! This is my go-to sprayer! Love it for big projects! Love this giveaway!! I plan to paint a buffet that I’m using in my office. Thank you for all your inspiration. This is awesome Corey! I’ve been meaning to try a sprayer!! I’ve been looking into getting a sprayer for a while, but the clean up always worried me. The cleaning kit sounds nice. And the spray tent is a great idea. 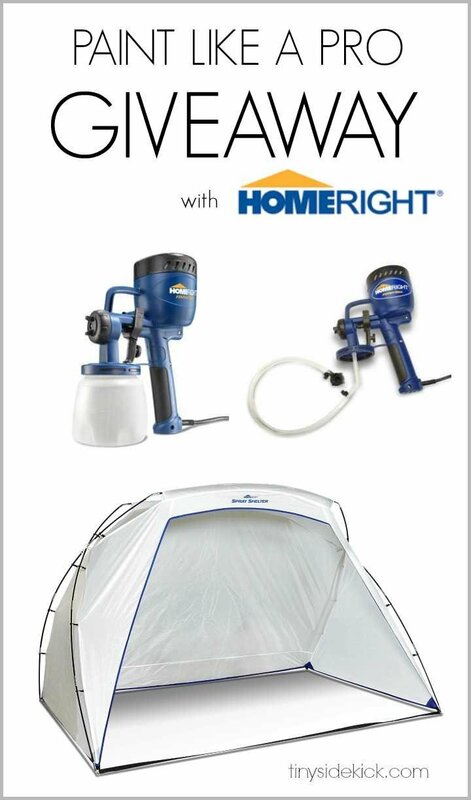 I have to admit, when i first saw the picture, I wondered why you had a camping tent with the sprayer :P.
We’re building a small greenhouse and man oh man, this would come in handy! I would love to paint my bedroom dresser. What a great giveaway! I’m already thinking of all the furniture I could paint with this sprayer! My new bar, I like making bars for my friends out of headboards and shelves. I was just brainstorming how I could spray paint in the house over the winter. Think this would work in a basement? My dining room chairs. Thanks for the giveaways! I have a long list of things to paint…interior doors, trim, update furniture with paint, my daughter’s brick home, and the list goes on. This would be great to have to paint the kitchen cabinets, not to mention a few side tables! ???? I have several projects just waiting for me in the garage right now. Next up is a set of vintage wooden doll furniture for my daughter. I am going to paint an old nightstand in our guest bedroom. The sprayer would make it so much easier! There are many things that need painting around my house. Picture frames, mirrors, dining room chairs, cabinet doors and many other things. This system would help speed up the process. Thank you for all the tips and give-a-ways. Love your blog! We live in a 1930’s farmhouse with original woodwork and hardwoods. It’s A LOT of wood, so I love accenting my home with painted furniture to kind of balance it out. 🙂 A paint sprayer would make that so much easier! I need to paint the back walls of 2 book cases in my Beautiful “Simmering Orange” home office. The backs shall be a Yummy Green Apple color. Thank you for this giveaway!! I plan to paint everything I’ve got stored in my storage unit! 🙂 Won’t my husband be happy! 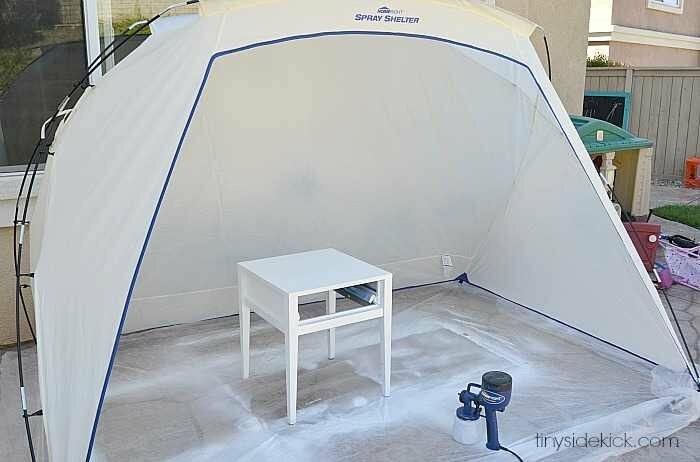 I would love to be able to try out a paint sprayer (especially with that awesoem tent) since I just spilled navy paint on the carpet of my work room! I actually have some side tables that I’ve been wanting to paint for a long time. This would make things so much easier! Thanks for the chance to win! This is an awesome setup! I’m looking forward to painting almost every room in my house. Plus I have several pieces of furniture and signs that I make to sell. This would make my life so much easier. Thanks for the chance to Corey. You review and your pictures really paint a picture (excuse the pun – lol) of how nice the product is. Love your blog posts! I have a thrift store nightstand and a table that need painting! This would really be a great addition to my arsenal. Love painting and this would make it all so easy. Love watching the transformations you create Corey. Can’t wait for the next one! Forgot to tell you what I am planning for my next project… I have a new shelf unit that we built. This kit would really help! Thanks so much Gina! Fingers crossed for you for the giveaway! Great giveaway…and with the cleaning kit! I have a great big hutch that would love to get a coat of paint! I need to paint my house on the inside and the outside of the barn!! I wish I had seen this before I spray painted my old child’s rocker. I need to re-do it!! My kitchen cabinets and my doors! Wow, this looks really cool. Love that it comes with a cleaning attachment, too. I plan on painting lots of stuff! Thanks. I mis-typed mirror (spelled it “mirrow”)…what can I say – I’m an English snob and had to correct it. Sorry, y’all! Hahaha. Too funny! Good luck on the giveaway! Winner will be announced on Monday! Corey, thank you for your inspiration and show-how! Oh my, if I win this giveaway I will paint the buffet, the armoir, the vanity desk, the mirrow, the end tables…and that ugly round table! Your blog is absolutely pure awesomeness and I will continue to read even if I don’t win! I would repaint some of my furniture, most of my rooms. So many ideas. A booth for spray painting! Sounds fabulous. I would like to paint a handcarved side table, an arched picture frame, some wooden plaques and some Mason jars. Then…who knows! You are an inspiration to me. After reading your blog, I am going to paint some foam leaves, a little shelf from Goodwill, and some picture frames. Your parent’s door is gorgeous, and I have b!een daydreaming about painting doors but will have to do them without taking them down. Thank you for bringing cheer and encouraging creativity. Winning this prize would be fantastic but I have already won by finding your blog. This made my day Nancy. Thank you so much for your kind words. I’ve got my fingers crossed for you! And technically you could spray doors while they are still on if you get creative with plastic sheeting and tape to protect everything around them 🙂 Hope you have a great weekend! I lan on painting cabinets in our new home! I have so many things that need to be painted: outdoor tables and chairs, laundry room cabinets, chicken coop, just to name a few! My next project is a desk a purchased a few months ago but have yet to refinish. Oh my goodness! I just recently discovered that they have one of those stores near me and my kids thought that mommy was in a candy store! Hahaha. I had so many ideas swirling though my head when I was there! What an awesome place! I love that mirror. …..did you paint that as well? I have a couple bookcases that I would like to paint the smae colour. I did paint that mirror with spray paint and used a sharpie to create the design. You can see exactly how I did it in this post. Thanks Corey! I pinned that post as well. Gosh, so practical for so many projects! I plan to paint my front door — it’s been a boring white since I moved in years ago and is ready for a fresh new color. Would love to win! Thanks!!! Oooooo! A fun color on a front door is my favorite! Good luck! I just did my interior doors recently! Crazy what a fresh coat of paint can do. Good luck! I plan to paint outdoor furniture and everything else I can think of. Thanks for the opportunity. Ha! That is just like me. I love to paint! That spray shelter is the coolest thing and huge too! Love it! It is! I was so surprised that I could literally fit a big dresser in there no problem! I plan on painting my kitchen table, an old chest, and anything else I can! Thanks! I have fallen in love with giving pieces a second life and a second chance. My husband and I have in the last month decided to purchase a sprayer as we expect to be doing updates to our home–walls and furniture. It would be cool to win one. . . Immediately, I have a table that I rescued from a garage sale needing minor repairs and a new paint color on its very ornate curvy legs. I just checked this item on the web and it is available at my local Lowes. So, if I don’t win, I’ll be purchasing it for myself. If it had not been for your blog posting and seeing what a remarkable job the Home Max sprayer provided, I would never have even thought about purchasing this product. I’d be doing it the old fashioned way. Oh, I will also buy the tent! Awesome product! It is available at hardware stores and is so worth the investment. I’ve also seen good prices on Amazon. Good luck! I plan on painting anything I can get my hands on! Especially my kids “hand me down” oak bunk beds. Looking to give them a makeover. I am planning to repaint my living room walls along with a computer desk. This looks perfect for that job plus a few others I would like to do down the line. 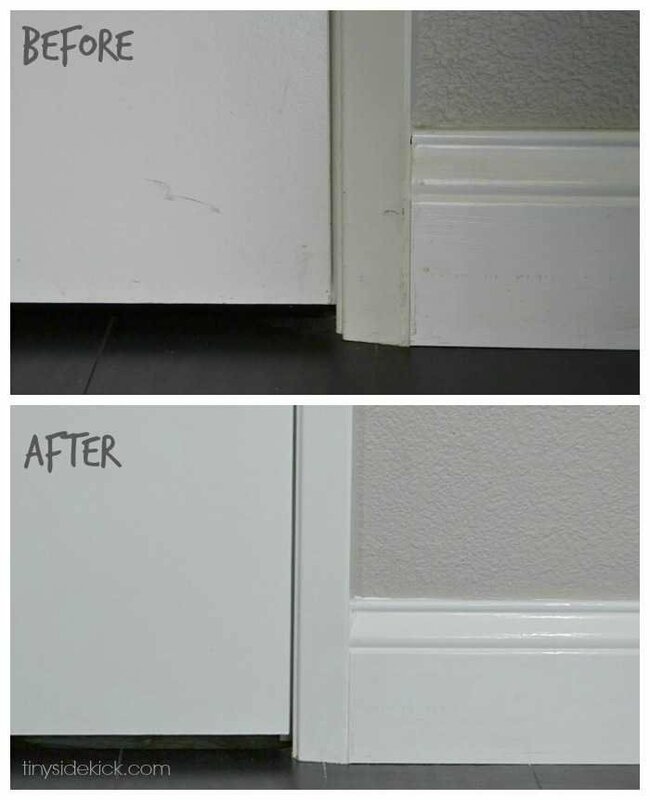 As an owner of the Home Right Paint Stick, I know the kind of results to expect: perfect. Wow! That pop up looks great! I’d love to try this stuff out! Thanks for the giveaway! I used a paint sprayer to refinish desks for my daughters first grade classroom. The painting was SO easy and the finish was great. Unfortunately the sprayer was very hard to clean, and when I tried use it last year for my kitchen cabinets it was a total disaster. I have cabinets and furniture and deck furniture waiting for a great finish job, sounds like this great sprayer might be the ticket! I’ve studied up on the best paint sprayers and I’ve seen so manny positive posts on the Home Right from Home Depot. Life would be great with one full kit. I can imagine great projects in my future with this set!!! Thanks for the giveaway. I would like to paint a dresser for my girls room and these tools would be handy. What DON’T I plan to paint? You provide such great inspiration as I slowly and thoughtfully renovate our 80’s ranch (hence the “paint everything!!”). I’ve heard not all paint guns are created equally, so really appreciate your recommendation. You are so welcome Sarah and thank you for cheering me on in this blogging adventure! There are so many things I’d love to paint as I’m constantly painting furniture in my home! I have been wanting to get one of these for quite some time! I think the first thing I would use it for is my dining room table! I sooooo need this! Joey Fatone! hahahaha! Good luck to you! So excited for this giveaway! I’ve been planning on redoing my bedroom furniture for a while now but keep putting it off because it’s going to take forever with this equipment it will be a million times faster and I could get started right away! Omg…..I would paint everything from my refrigerator & dining room table to picture frames & jewelry boxes! Thank you so much for the chance to do so many new crafts! It’s the setting up and clean up that keeps me from painting. Looks like the tools you’ve found get rid of that excuse for me! Ugh! I know the feeling and yes these make it all so much easier! Love the finish sprayer! I used it on my fence and cut my work time tremendously! I found some bar stools in front of a dumpster at work and want to paint them. These pieces are great! I am becoming seriously inspired! Cleaning a sprayer is the worst not to mention the overspray. This looks like it takes care of both! I would love to spray many pieces of furniture that I have for my kids now that they are getting their own places. The spray tent would solve all of my problems! (My hubby, bless is soul, is worried about over spray. This would make it all happen! Hi Wendy. This actually doesn’t over spray that much but the shelter is a great thing to have anyway. My hubs worries sometimes too so I always plan projects when he is out of town 🙂 Hahaha. Shhhhhh. I plan to paint some old garage storage units to use in my craft room. After that, I want to spray paint the inside of an old shed (floor, walls, and rafters) to transform into a party room. YAY!!! BTW….I love your blog. You have so many wonderful and inspiring ideas!! Those projects sound so great! And thank you for your virtual high five. It is so much fun to be a part of such a creative community! What an awesome giveaway! I have an armoire and buffet cabinet waiting for a makeover and I’d probably give my kitchen cabinets another coat since I gave up on painting them by hand! What a great giveaway! I really , really, really would put this to good use: I have a ton of secondhand furniture waiting in the garage to be upcycled with a fresh coat of paint. This would get the job done much quicker! Good luck! I know the feeling of someday projects piling up in the garage! A fresh coffee table sounds perfect! Good luck Ali! I’ve never thought of that, but it would be awesome! I have always been curious about sprayers and how much extra work it is but this kinda looks cool, I especially love the spray tent. I think I will have to bite the bullet and give it a go one day. Thanks for the tips! I plan to paint anything & everything. Especially if it’s as easy as I have read it is. You are going to become a painting fool! Good luck Randa! I plan to paint my son’s rocking chair, and then a couple dressers that need to be refinished. I’ve done both a rocking chair and the drawers of a dresser and the finish is awesome! High five and best of luck with the giveaway! SUCH a great giveaway Corey! I can think of a million things I’d paint with this, starting with a beautiful antique buffet table and hutch I’ve been meaning to tackle for ages! Hahaha. I think we all have those huge projects waiting for us in our garages! Fingers crossed for you Kristi! I love your blog and super do-able ideas! Thanks for the inspiration. What a great kit to update old furniture. I have a mirror that needs updating – would love to see what I can do using this set! Thank you so much for this amazing compliment! Fingers crossed for you! Hope you have a fantastic week.